April 3rd, 2018. 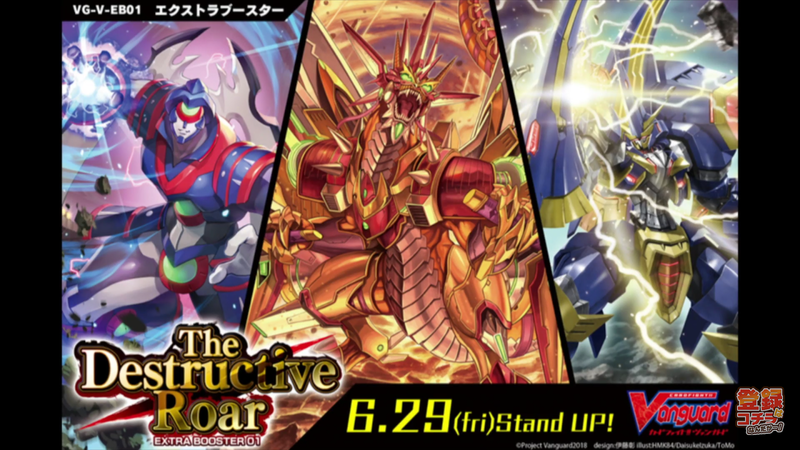 In the 26th episode of Weekly Bites Z, Doctor O announced the formal title of the upcoming Extra Booster, V-EB01: The Destructive Roar. 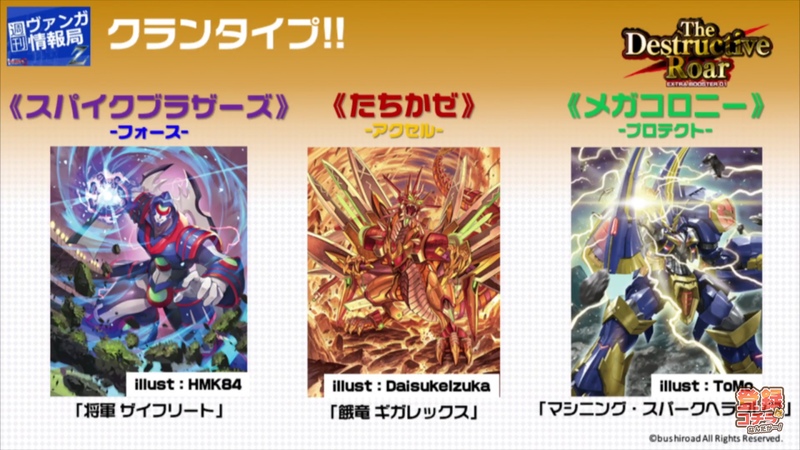 The first Extra Booster of the Standard format will launch June 29th 2018 in Japan, feature 66 cards of support for Spike Brothers, Tachikaze, and Megacolony, with its cover cards being General Seifried, Ravenous Dragon Gigarex, and Machining Spark Hercules. 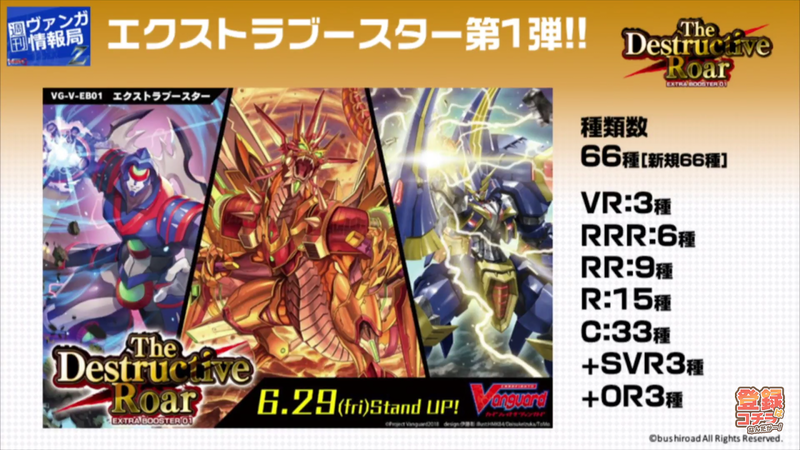 The set will feature 3 Vanguard Rares, 6 Triple Rares, 9 Double Rares, 15 Rares, and 33 Commons, with 3 Special Vanguard Rare alternate prints and 3 Origin Rare versions of cards, which will use their original artwork from the previous version of Cardfight!! Vanguard. 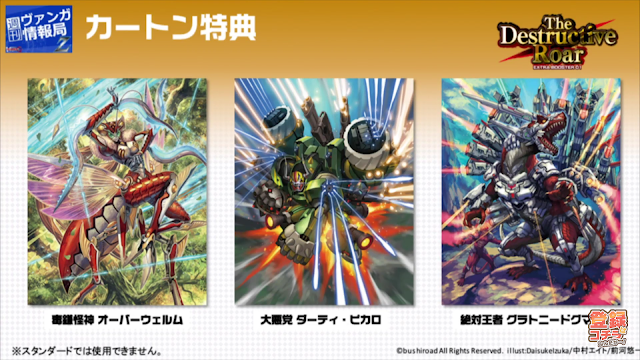 General Seifried is illustrated by HMK84, Gigarex by DaisukeIzuka, and Machining Spark Hercules by ToMo. Spike Brothers will be a Force clan, Tachikaze an Accel clan, and Megacolony a Protect clan; Tachikaze will be one of the clans to receive Front Triggers. Juggernaut Maximum and Machining Stag Beetle will also be remade in the set, with new illustrations by their original illustrators Maekawa Yuichi and Tanimeso. There will also be a small bonus, reprints of Poison Sickle Mutant Deity Overwhelm, Great Villain Dirty Picaro, and Absolute Ruler Gluttony Dogma, included in booster boxes of The Destructive Roar. 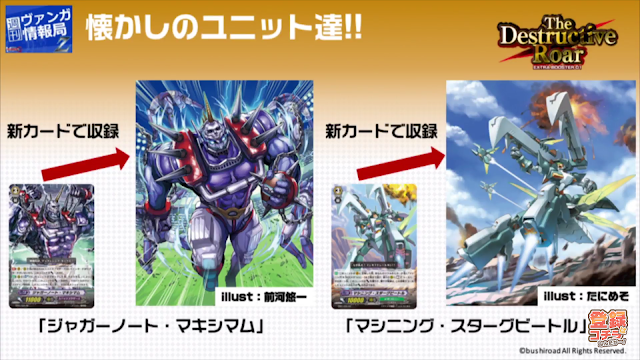 These strides will not be usable in Standard format, per the notice at the bottom.